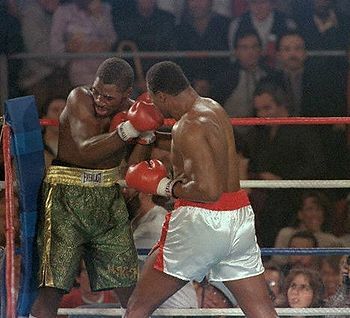 Thirty years ago, Marvis Frazier fought undefeated champ Larry Holmes for the heavyweight boxing title. Marvis was an outstanding amateur, but he had only been in 10 pro fights. An inexperienced fighter named Marvis Smith would never have gotten a title shot, but Marvis’ dad was the legendary Joe Frazier, so he did. The hype leading up to the bout was incredible, with Frazier posing on magazine covers and being interviewed by adoring reporters. The fight itself was preceded with an hour-long special about Frazier, all but crowning him the champ. Holmes meanwhile was disparaged in the run up to the fight as too old, too slow and too boring to beat a charismatic figure of destiny like Marvis Frazier. In the first and only round of the fight, Holmes beat Frazier like a rented mule. A single crushing punch sent Frazier flying. Once Frazier got back up, Holmes pounded him at will while literally gesturing to the referee between punches to stop the fight because Frazier was out on his feet. As a young boxing fan, I felt really conned by the press over this, because it was utterly obvious after the slaughter that the fight was never going to be close. If Frazier had had 100 tries, he would have been destroyed by the mighty Holmes every single time. But for their own reasons (they sold a lot of those magazines), sports journalists grossly misrepresented how close the match would be. Older and more cynical, I have become wary of the desire of the media to make battles sounds epic when they are in fact going to be walkovers, a feeling I have experienced acutely throughout the Sanders/Clinton matchup. The amount of “Clinton campaign in disarray/Sanders surging” coverage has been every bit as uncritical and self-interested as the lead up to the Frazier/Holmes fight. I say this with no animosity to Sanders, who seems like a perfectly decent man, but his campaign ended in Iowa. The state was tailor made for him and he lost (though much of the press coverage framed it as a win). If he had won by 20 points there, it would have been significant, but he lost in a super-white, super-liberal caucus state that favored him as much as any outside of his own neighborhood. I don’t blame Sanders’ young fans for thinking he could win. Young people should be idealistic and have big dreams and it’s not their job to be as jaded as I am. But professional journalists have a responsibility to be critical and careful in their reporting. Many of them really, really misrepresented Sanders’ prospects because they wanted a horse race when there just wasn’t one to be had.